One of the most effective flies ever invented - catches salmon as well as trout. Dr. T. C. Wickham and his friend and fly-tier Jack Hammond from Winchester had a communication problem, somewhere in 1884. The Wickham's Fancy was the result of this misunderstanding. I like to tie the Wickham's with copper wire ribbing, to make it sink better, then fish it at the point of the cast. 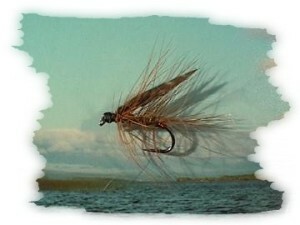 From June onwards, when sedges are about, it is a fantastic brown trout fly. In it's bigger sizes it is well worth putting it on a salmon cast. Hook sizes are ( 6 ) 8 to 12 for this pattern. I parked my old battered and weathered car in front of a local hotel, walked in to the reception and asked for a certain Dr. M. from Dublin. Just having his breakfast, I was informed by the girl behind the counter and she lead me into the dining room, to a table, where a middle aged overweight man had a full Irish. Good morning sir, said the girl , this is your gillie. Grand, grand, here, have a seat and a cup of tea and tell me what we should do today! Did it rain enough last night for the rivers? I explained that it had, and that an odd shower was to be expected, suggested to go to the Owenea and try to catch a salmon. Splendid, said the guest, that sounds like fun. A couple of minutes later both men stood at the reception and the girl issued a day ticket for the Owenea River ( yes; there was a time when it was that easy to get a day's fishing ). Then we left the hotel, walked over to the car park, where my red and rusty vehicle waited. I'd rather go in mine, the Dubliner nodded into the direction of a biggish gold metallic Mercedes. Fine with me, I smiled and took my gear out of the rusted boot, to put it into the spacious trunk of the noble vehicle. The ride was comfortable, though a little hasty for my liking. When we turned off the main road, onto a narrow lane leading to a pool called Gubbin, heavy scratching noise of lane surface against car under-body was audible, easy now, I warned. It's just a car, remarked the guest philosophically and grounded the car two more times before they came to a little parking lot. You know, I have never caught a salmon. I actually haven't caught much on the fly rod at all so far, I only took it up this spring. What would you suggest, what should I put on, do I have the right flies? I opened the golden metallic fly-box the Droctor handed to me, you have them all, I answered, and a few more, selected two flies and made up a cast for the man. It was a five minute walk from the car park to the Gubbin and there was one stile to cross; enough to bring sweat out on the Doctor's face. A green wooden bridge at the end of the pool leads over to the other bank of the river. A couple of rocks above it were just submerged, perfect water, I said, you see, there is a good lay just in front of that rock in the middle. Cast towards the bush on the far side and let it swing around. The wind from behind and movements reminiscent of Rumpelstiltskin's dance around the fire, my guest unfolded his line and presented reasonably well. As the flies came round, in front of the rock, a hefty swirl was pushed to the surface; the currant carried it fast away. I was waiting for a strike. The Doctor was perplexed, even when he heard my words: strike, man! strike! coming through to him as if from another planet. They were of course my words. Only after I repeated them he lifted the rod and at the rock in the middle of the river something big and silver thrashed at the surface. Jesus! said the Dublin guest. Don't give too much pressure now! Or he'll go down below the bridge and we'll never see him again, I shouted. But the salmon decided to come upriver first; so speedy, that the angler could not wind up slack line enough. He couldn't make proper contact. Then the fish roared downstream, becoming ever faster towards the end of the pool. The rod bent down heavy under the strain; the Doctor, never noticing the salmon's change of direction, still winding in, only felt a jerk before the rod bobbed up, the supposed loot gone. For a couple of seconds both men stood motionless. I am a happily married man, the Doctor said then, but that was the most exciting thing that happened to me in a long time. I hope you don't get me wrong. Not in a million years, I comforted the man.